One of our readers reported ... We were watching the White Tailed Deer graze in the field behind our home at Scotch Block Lake, Speyside area. They raised their head often and the white tail would raise and lower often. The larger one stood with the tail and ears raised for a long time. The four smaller ones disappeared into the forested area. From the forest a Wolf appeared. Using the binoculars, it was very clear that it was not a Coydog, but a Grey Wolf that was very healthy looking and quite large. The Wolf approached it slowly. The deer did not run but approached the Wolf. Eventually they were close enough to have a conversation. The Wolf appeared to be walking away with the deer slowly advancing toward it. It was a game of cat and mouse, but I feel that the Wolf was luring the Deer into the wooded area. We lost sight of them. January 2016, Phil from Stirling, Ontario, said ... I was returning from a nice winter walk with my wife and my dog, when I spotted a dog-like figure in the field behind my house. As I walked through the field with my dog, we managed to get close enough to see that it was not a dog or Coyote. It was at least 75 pounds or so and almost the same size as my 100 pound retriever mix. My best guess is that it was a Grey Wolf. It was looking for his next meal, as we were able to get close enough before spooking him away. I will be keeping an eye out for him and his friends, I'm sure he will return. One of our readers from the town of Blue Mountain said ... We were walking in the ravine near Alpine Ski Club and we saw what looked like Wolves. Their faces were black with white highlights. After looking up pictures of Coyotes and Wolves we are thinking they were Grey Wolves. Is this a possibility? Tom Ashwell from Kitchener wrote ... October 01, 2015; 9:30 am. One Wolf ran across the road between our two cars as we were traveling north to Cape Chin South Road. The animal was significantly larger and longer-legged than a Coyote. Debbie from Mount Albert wrote ... My son and I were heading home to Mount Albert a few years ago when I spotted a huge black, what I thought was a, dog at first. So I slowed down and pulled over. Four other vehicles pulled over obviously just as stunned as us. I pointed across the large field and asked my son if he saw it, and as we observed it we came to see it was the largest, darkest Wolf we had ever seen. It came up about 2\3 of the way up a five-rail fence, so just about waist height. I think some people must have put their window down to take a picture cause the head came up our way and it seemed to scent the wind and it turned and slunk away back into the forested area behind the farm. Its a sight I will never forget. Steve from Madoc, Ontario said ... I saw a black Wolf in our backyard just south of Madoc, Ontario. It was black with some grey. This was at 11:30 am on 24 January 2016. Another reader wrote ... I saw a Wolf about 10 feet away from me about 15 minutes ago. One of our readers said ... At 2 30 am saw a Wolf in Toronto running down in the middle of the road going south on Martin Grove then ran through the park on the Westway. I though it was a dog until I got closer. He was about 80-100 pounds. 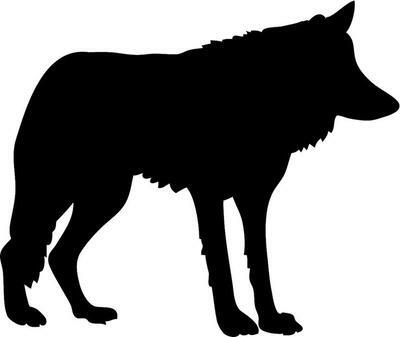 November 2015 one of our readers said ... last night I heard yipping of wolves in a forested area north of Chippawa Creek in the Airport Road and O'Brien Road area. It lasted maybe between 5 to 10 seconds. It put a chill down my spine because I walk my dog at 5:30 a.m. and I heard the Wolves at 3:30 a.m. It was Scary. Thank you to all our readers who took the time to write about their Wolf sightings. I have included the two sightings at the bottom of the page, but it is more likely that those animals were Coyotes because they were seen in Toronto and in Chippewa.